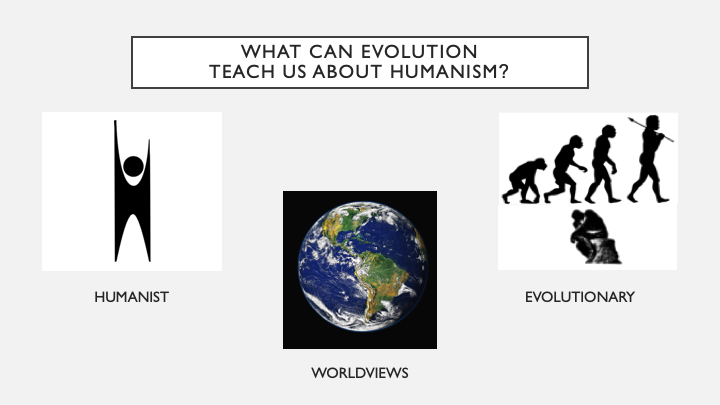 What Can Evolution Teach Us About Humanism? On Thursday, March 21st, 2019, I presented a talk about my evolutionary philosophy at the Annual General Meeting of the North East Humanists. It was a real honour to be invited, and the 40-minute presentation I gave was one that I slaved over for months and months (including many sleepless, nervous nights). The result summarises my work in what I think is one of the best formats I've come up with yet, so I thought I'd share it here for anyone who couldn't make it to the event, as well as for those who did go but wanted to review the material again. Anyway, I hope you enjoy it here and, as always, I welcome any thoughts and questions below. To answer that question, I’m going to go over three things tonight. 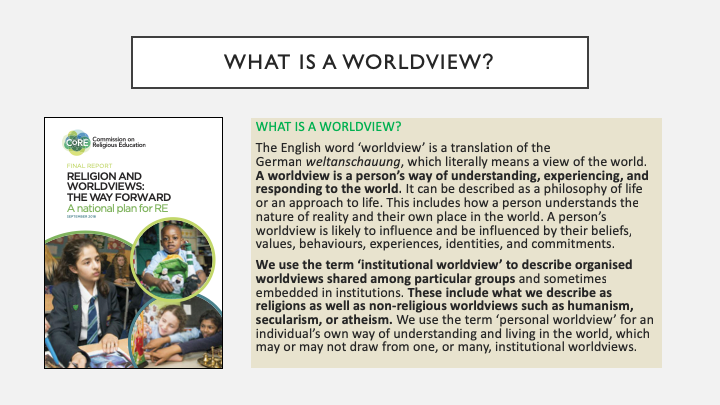 What is a humanist worldview? 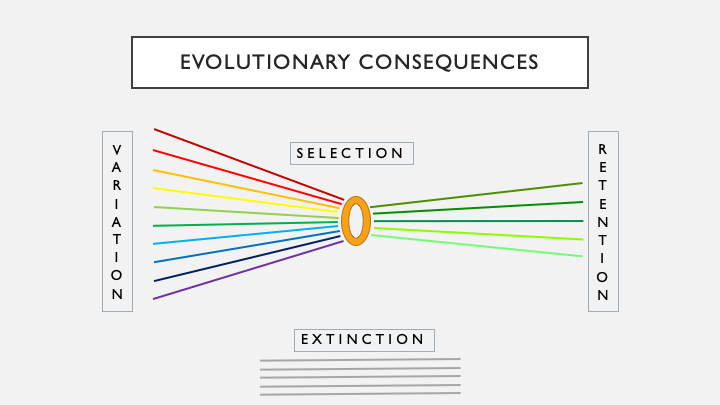 What is an evolutionary worldview? 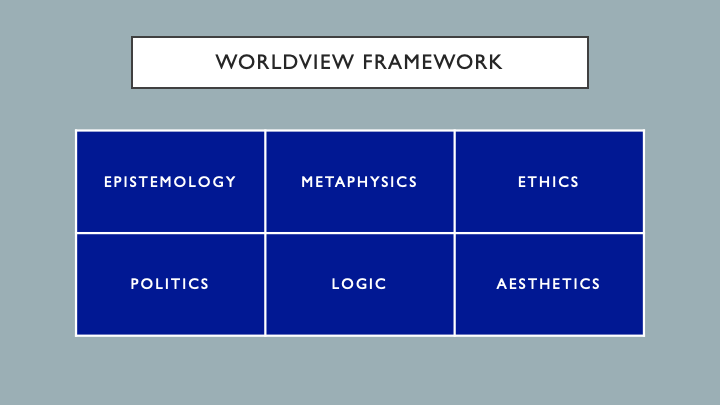 And more fundamentally, what is a worldview? How can we actually compare these sorts of things? 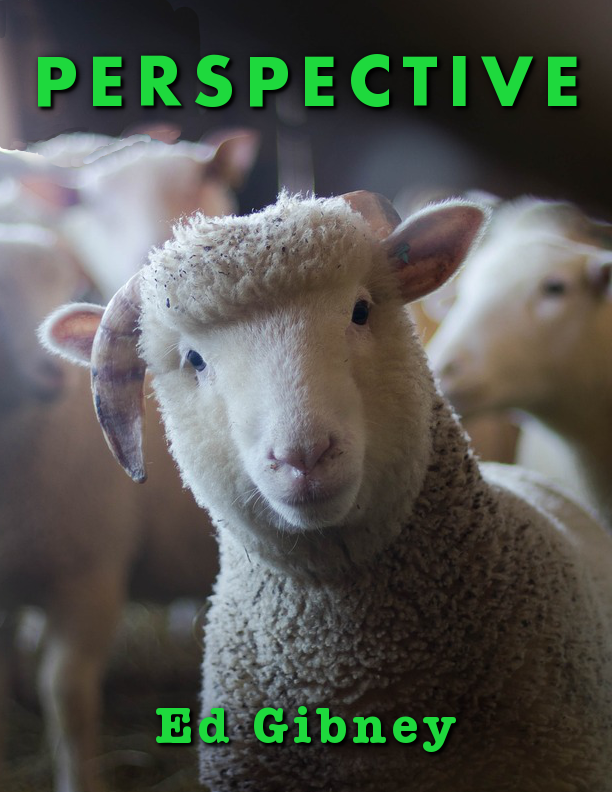 For the humanist worldview, I’ll try to describe that using the information I found in the online course from Humanist UK (HUK) that I took in January. For the evolutionary worldview, I’ll try to describe that by summarising the philosophy I’ve been working on for the last several years. Hopefully, once these two worldviews have been laid out side by side, we’ll be able to see how they might be able to learn something from one another. But before we can get to that general comparison, we have to define what it is that we are specifically going to compare. So, here are some examples of institutional worldviews from religions as well as from humanist groups. For Christianity, there’s the Nicene Creed. Buddhism has its four noble truths and eightfold noble path. Islam has its five pillars that come from the Quran. The IHEU (now called Humanists International) has published two versions of a manifesto called “The Amsterdam Declaration.” The American Humanist Association has a brief but exacting statement that defines humanism and is published on the inside cover of every issue of their magazine. And we North East Humanists have a list of seven items on our website under a page called “What We Believe.” I find these all really interesting, but they are hard to compare with one another. 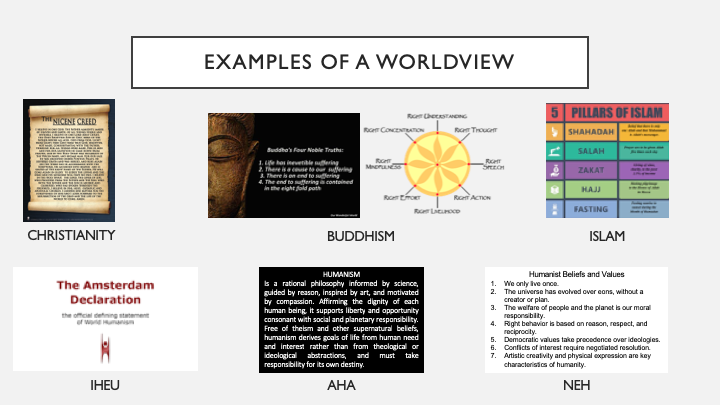 Without a more exact definition of a worldview, it’s hard to analyse how they all overlap or contradict. 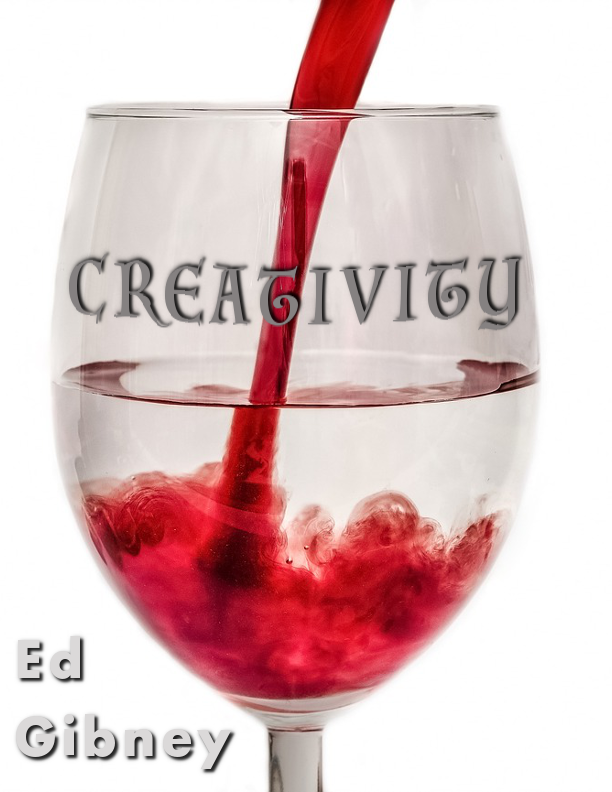 These are ideas that we all have, either consciously or subconsciously. The elements are often interwoven and reinforce one another, but sometimes our beliefs might contradict each other too. It’s hard to dig in and examine this, though, unless you have a good checklist for everything that’s supposed to be in a worldview. 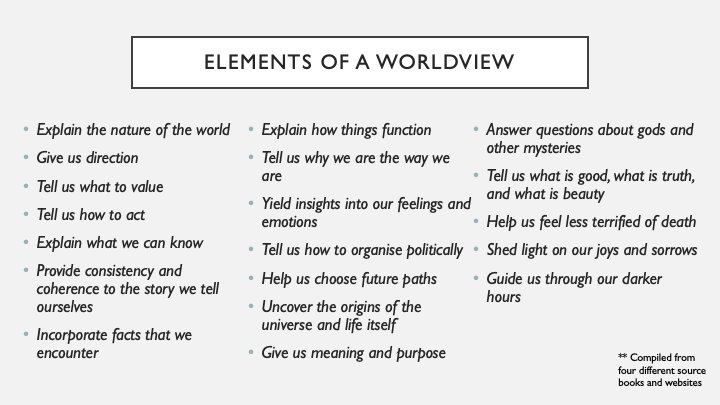 Well, to make a long story short, this is the best checklist, or framework, that I’ve found for how to look at worldviews. 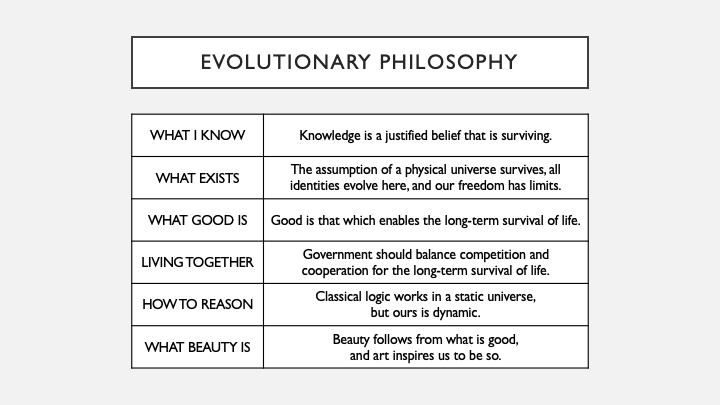 Quite simply, these are just the six main branches of philosophy as they are currently broken down. This makes sense when you look at the history of philosophy. Long before there was science, philosophy was the field where people went to study unknown things in the world. Aristotle wrote tons about biological classifications. Before that, the pre-Socratics wrote about atoms and the five basic elements of the universe—these were essentially their versions of physics and chemistry. Even Isaac Newton’s landmark book was called Mathematical Principles of Natural Philosophy. But once the scientific method was defined during the Renaissance and Enlightenment periods, basically any time a subject became understood well enough to be tested empirically, these pursuits were then split off into their own discipline. This is why some people have characterised the history of philosophy as one that spawns science. And so now, philosophers are left with only the most difficult things that we can’t quite wrap our arms around to measure and be certain about. That’s where radical choices can still made about what to believe in or not to believe in. In other words, this is where we can still find the greatest differences in our worldviews. 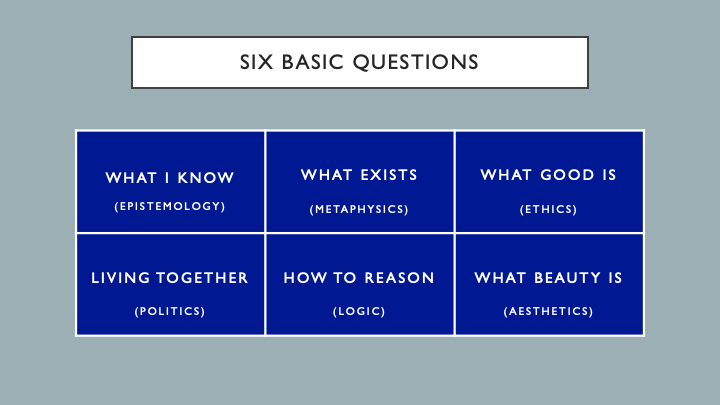 If we get rid of the jargon and just look at the six basic questions that these branches are trying to answer, then it becomes easier to see how this framework covers all of the nineteen elements of a worldview that we saw earlier. Epistemology studies what I can know. 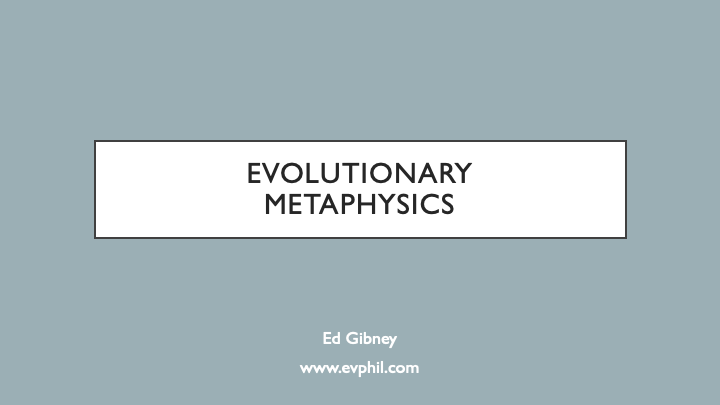 Metaphysics looks at what exists. Ethics tries to describe what is good, what is moral. Politics tries to answer how we can all live together. Logic looks for rules on how to reason and debate these things. And aesthetics searches for what beauty is, and how that might motivate us and give us meaning in life. To make this all a bit clearer, I thought it would help to go through a quick example. 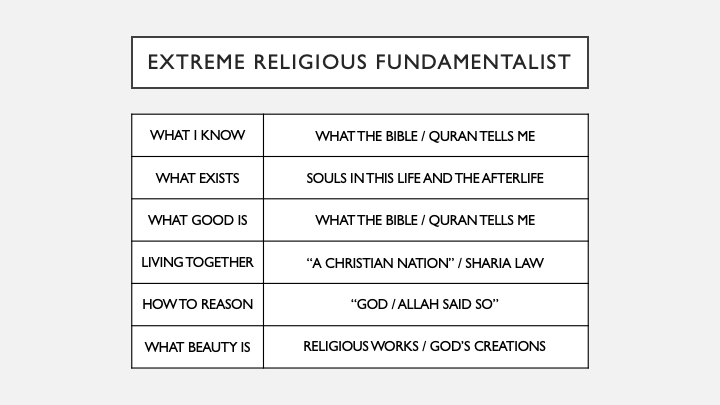 So, let’s look at a simplified worldview of an extreme religious fundamentalist and see how that would look in my framework. They would say that what they know comes completely from the Bible or the Quran—from the one book that has revealed truth to them. As far as what exists, they may recognize that this world does, but only as a staging ground before their souls go on to heaven or hell. And since that afterlife is infinitely long it’s much more important than anything that happens here. As far as what good is, that also comes completely from whatever they’ve read in their holy books. And so, politically, they will work to see sharia law or “a Christian nation” implemented widely and based upon these earlier principles. When arguing about these things, they may try to be as logical as possible, but ultimately, they will always have to fall back on whatever it is that God or Allah said. And finally, when thinking about what beauty is, they tend to focus on religious works of art, or they look at natural things as simply part of “God’s wonderful creation” since he’s the only thing that can give meaning to life. So, again, this is just a simplified example. Most people, even religious fundamentalists, are more complicated and nuanced than this. But I hope it shows that if you go through the details of these six items for a person or an institution, then you should begin to have a very good idea of what they are like. Okay. So how would we describe a humanist worldview then? 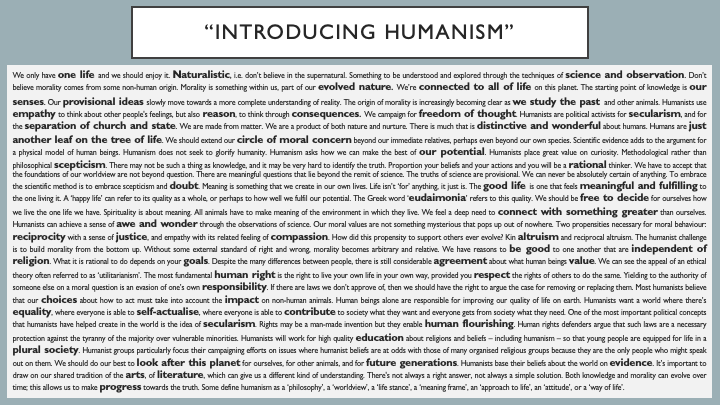 These are some highlights from the nearly fifty pages of notes I took during the six-week online course called “Introducing Humanism.” The words and phrases in bold were the ones that I thought best represented what HUK thought humanism is or could be. Let’s try to boil that all down into my framework and see what that looks like. Before I jump in, I should say that the course was filled with disclaimers about the fact that no one can speak for all humanists, and there were a few examples given of differing viewpoints too. That’s why I have the question mark at the top of the slide. But let’s just take this as one humanist worldview, and then we can use that for further discussions. So, taking that into account, a humanist might say that what we know comes from empirical observations only. Since there are no revelations from gods available to us, that leaves us with the scientific method, very broadly defined, as the only way to gain knowledge. And that knowledge is only ever provisional, because new observations might come along at any time that contradict what we currently believe, and we have to remain open to that. As far as what exists then, we’ve never detected any supernatural interventions in the universe, so we’re left with natural descriptions, or what is known as physicalism in philosophy. Without any reason to believe in a heaven or hell, humanists focus on this one life, and we try to make it a good one. So, what is good? Well, humanists think we get a sense of that from being social creatures who have evolved reasons to feel empathy and take care of one another, or indeed of any living thing that can feel pain and suffering. The course also mentioned repeatedly that because there aren’t any gods coming to save us, it’s up to us to take responsibility for the Earth and everything that we do to it. Politically, humanists have had a long tradition of campaigning for secular, just, free, and educated societies, in particular focusing on issues of human rights. In liberal democracies, this is built on something called the harm principle, which I’ll talk a bit more about later, but basically it means that we should be free to do what we want as long as we don’t harm others with our actions. 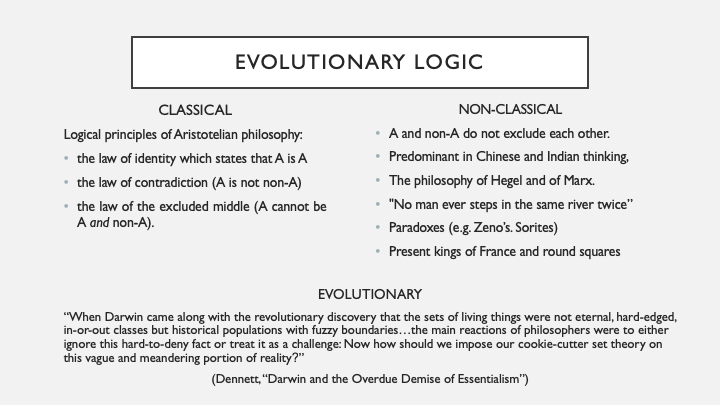 The online course didn’t mention anything specific about the field of logic, but it did point out that we need to use reason and rationality to make our way through the world, so I’ve assumed there was an acceptance of what is called classical logic here. Finally, the course did end by noting that we humanists, contrary to what some might think, can also experience awe, beauty, and purpose, by simply enjoying nature, leading meaningful lives, or helping other humans flourish. 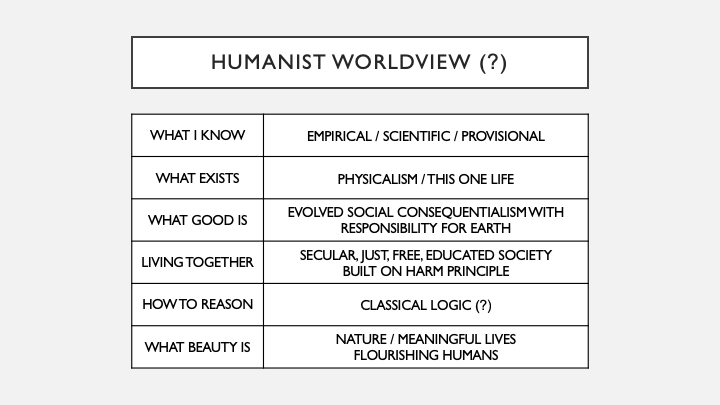 So, altogether, this is the summary that I’ve put together of what the humanist worldview is, and it’s something I definitely want to hear your opinions on during the Q&A. But before we get to that, I want to go through some of my own philosophy and see how that might support or challenge some of these ideas. 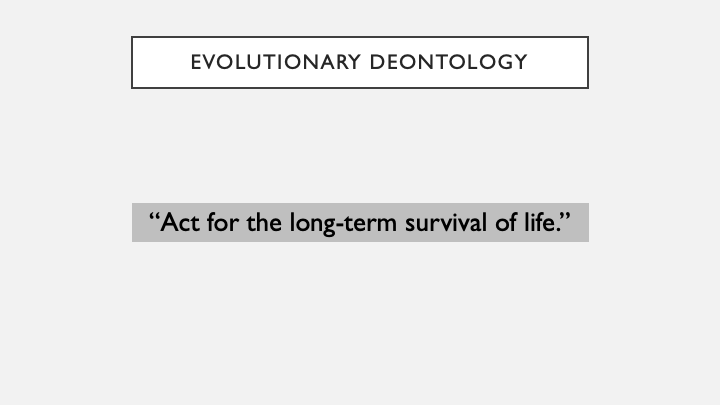 So, this is the banner that I have at the top of each page on my website as I write philosophy that tries to keep the principles of evolution foremost in mind. This is something that the majority of philosophers in history obviously couldn’t do because they lived and wrote before Darwin. But even for the ones who came after him, the science around evolution has grown so quickly that later philosophers have often struggled, in my opinion, to keep up with latest developments and what they mean. Especially if they have remained focused on other pre-Darwin philosophers. 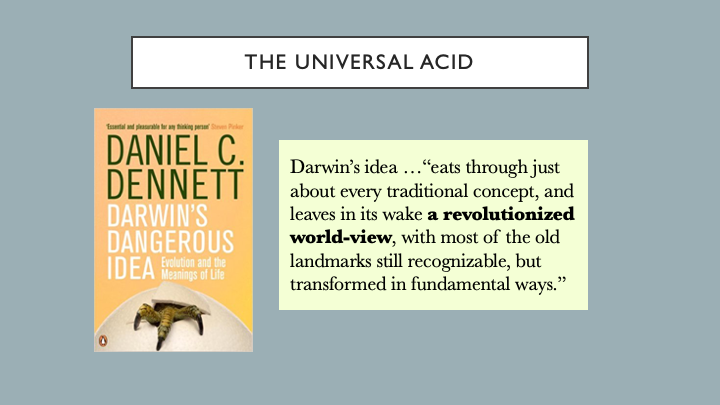 One philosopher who hasn’t missed this, though, is Dan Dennett who described evolution as a universal acid capable of eating through everything. In his book, Darwin’s Dangerous Idea, he said evolution “eats through just about every traditional concept, and leaves in its wake a revolutionized world-view, with most of the old landmarks still recognisable, but transformed in fundamental ways.” I agree with that completely and have found that evolution eats through every single element of my framework for worldviews too. So, I’d like to go through them all one by one now and try to show you what I mean by that. 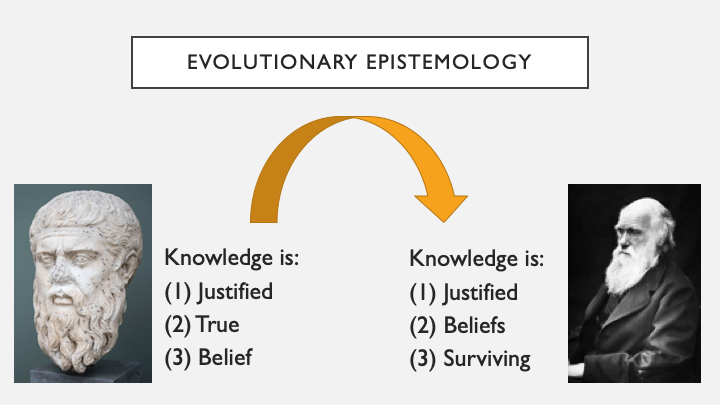 The first part is evolutionary epistemology, or what we can know. The humanist course mentioned that we may not be able to know truth, but they didn’t say why, and I think that’s important enough to go into for a bit. Well, the story starts about 2400 years ago when Plato defined knowledge as Justified, True, Belief. That definition held up in the West until about the 1960’s when a short thought experiment known as the Gettier problem cast doubt on whether anyjustifications could ever be good enough to prove something could be true. From an evolutionary perspective, though, this seems obvious. For something to be True with a capital T—eternally and always True—you’d need to find an eternally stable and known thing in the universe. But as Darwin and others showed us, the universe moves and changes, and perhaps more importantly, we cannot know what the future may bring. And so, philosophically speaking, we can’t be 100% sure that anything we claim to know will ever stand the test of time as being True. That leads us to define knowledge as Justified, Beliefs, that are Surviving. And when I say surviving, I don’t just mean these beliefs are existing in someone’s head somewhere; I mean that they’re capable of surviving our best rational tests. Justified beliefs shouldn’t be discarded just because we can’t be sure that they are True. They should only be replaced when we find even better justified beliefs. And since it seems like this is something that will always continue to happen, we should say that our knowledge will continue to evolve too. 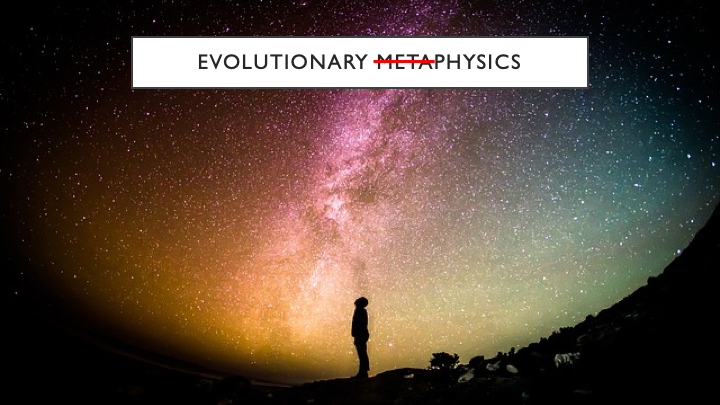 Next up, is the branch of metaphysics, or what exists. Basically, the evolutionary position here is just to drop the meta since all we’ve ever witnessed in our evolutionary history are physical processes. This is also similar to what the humanist course said, but it does lead to positions on a whole range of philosophical issues that weren’t discussed in the course. Issues such as identity, the mind-body problem, consciousness, and free will. I’ll be happy to discuss any of those in the Q&A if you want, but for now I think it’s fine to just move on in broad agreement about this view of the universe as natural, i.e. non-supernatural. The next branch in my framework is ethics. 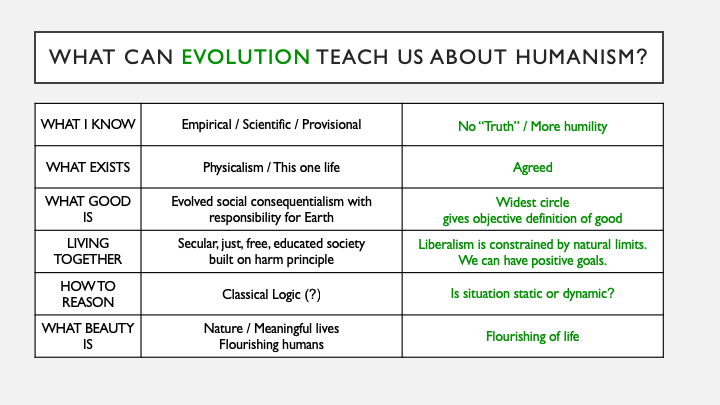 This is where we see the most difference between an evolutionary philosophy and the humanist worldview, so I’ll need to spend a bit more time on this. 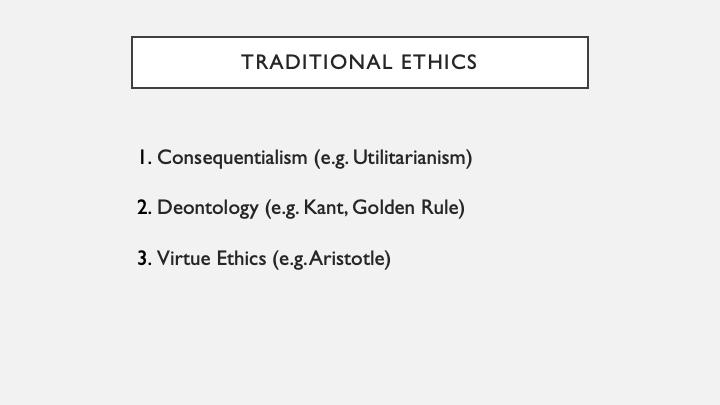 So, we see here on this slide that ethical positions are traditionally divided into three camps. The first is consequentialism, which, just as the name implies, tries to determine if our actions will have good or bad consequences. Utilitarianism is the most famous example of this, and it’s one that the online course said is often appealing to humanists. The second traditional camp is deontology, or rule-based ethics. People in this camp look for hard and fast rules to govern our actions. Rules such as the Ten Commandments, the Golden Rule, or Kant’s categorical imperative. 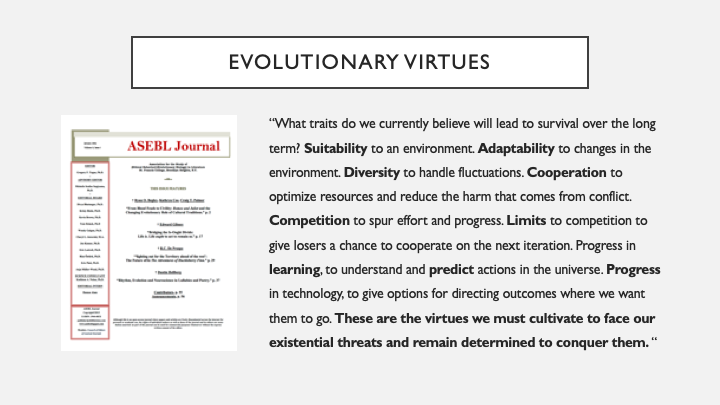 Finally, the last camp of virtue ethics traces back to Aristotle who tried to find character traits that are always virtuous in and of themselves. Now, all three of these camps have problems with them, however. We can’t always know, for example, the full consequences of our actions, and we don’t have accepted definitions of good or bad outcomes either. And for the last two camps, philosophers have always managed to find exceptions where rules or virtues just don’t work the way we want them to. That’s why surveys of professional philosophers show that they are all over the map in terms of which camp they think is the best one. For me, though, I think an evolutionary perspective can help to modify each of these, and then combine them into a new and stronger position. So, let me go through each of those. 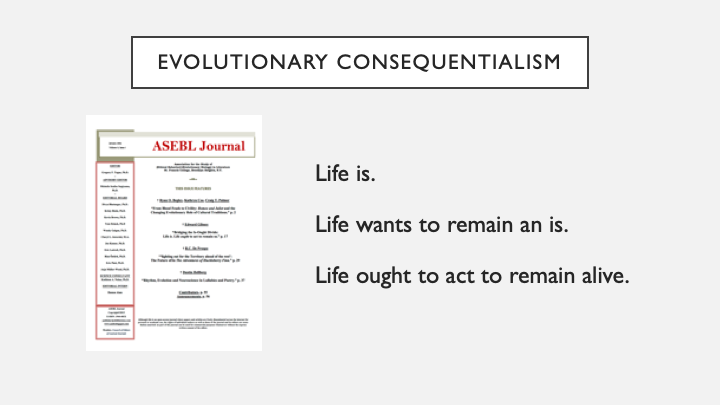 To start, if we want to talk about consequentialism, it helps to think about evolutionary consequences. 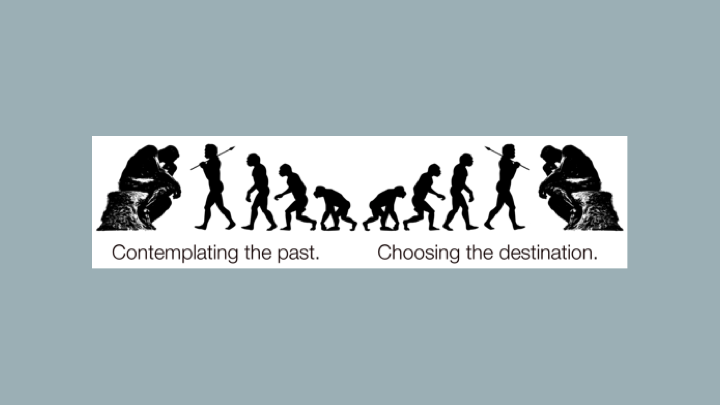 This simple picture shows the fundamental way that all evolutionary processes work. There is variation in a population, some selection mechanism, and then the retention of just a portion of the original population. Do this over and over, and you have evolution. We usually say this is done blindly in nature, so it’s often characterised as BVSR (blind variation selection and retention), but after Darwin, there’s no reason we have to be blind about it anymore. So, there may be a few different selection processes—natural selection, sexual selection, multilevel group selection, and even rational selections of cultural memes—but after any one of them, there are only two possible outcomes in any evolutionary process. Retention……or extinction. Unless you believe in afterlives, that’s all there is. And most of us know which side of that equation we’d like to end up on. But how do we choose whose evolutionary interests get met? 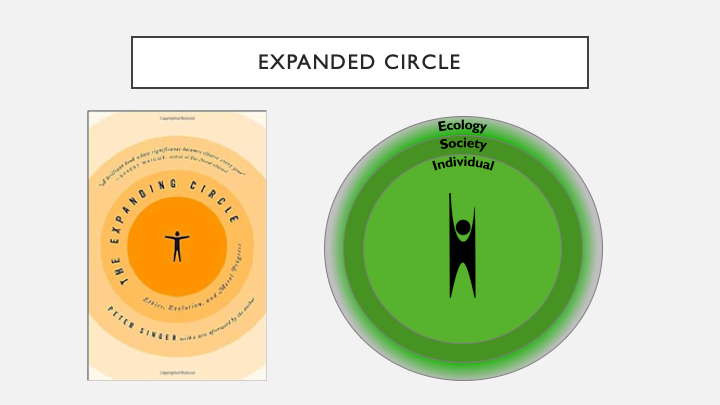 The humanist course cited Peter Singer’s work on this question quite a lot, and in particular this book called The Expanding Circle. In there, Singer said it would be a logical error to look at our evolutionary history and make the case that any one person, social group, or even species are deserving of special interests as God’s chosen things. And so therefore, Singer thought we ought to give equal consideration to all of these groups. He said that we could use our reason and empathy to expand our circle of moral concern to include all sentient creatures. Now I think this is a step in the right direction, but by giving everyone equal consideration, Singer gave us no way to judge between competing interests. Which is more important, for example? My economic livelihood, or the life of a fish? Singer may have brought more beings into our moral conversation, but he still left us squabbling between various circles of insiders and outsiders. But if you look at our evolutionary history, of course, we’re all inside the same circle. All of life is related and interrelated. This is something that the evolutionary scientist E.O. Wilson talked about extensively in his book Consilience, subtitled The Unity of Knowledge. 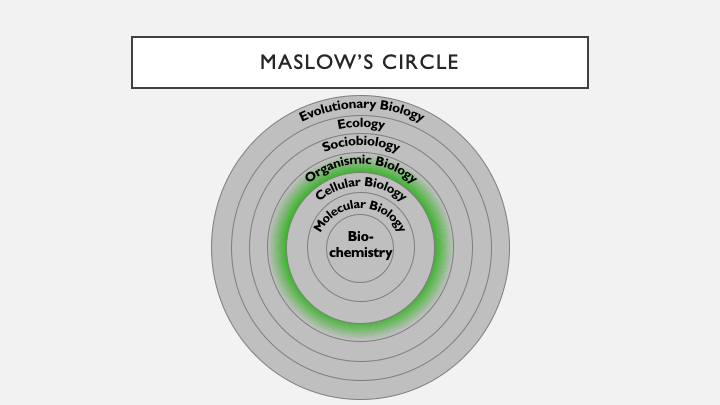 This book was his attempt to unite all of the different fields of biology, which he felt were becoming too siloed and separate from one another. And the way that he proposed to do this was by organizing them into larger and larger circles based on the magnitude of time and space. 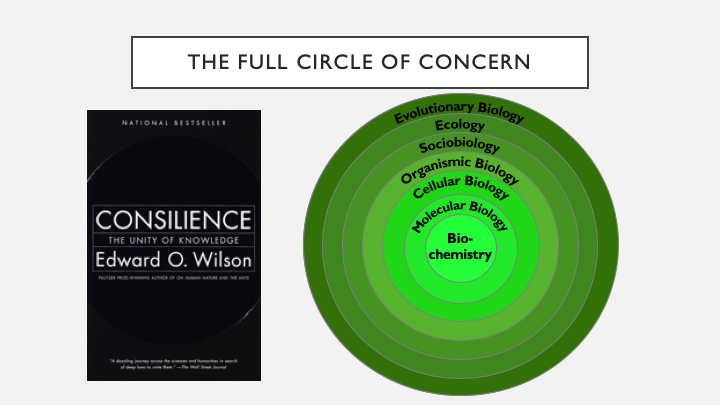 As Wilson said, biology, the study of life, starts with biochemistry at the smallest levels, which under certain conditions forms molecular biology, and cellular biology, before the creation of individuals who can be studied in various forms of organismic biology. Those individuals can then be examined in their different social groups, that live in different ecosystems, and adapt slowly over evolutionary timeframes. 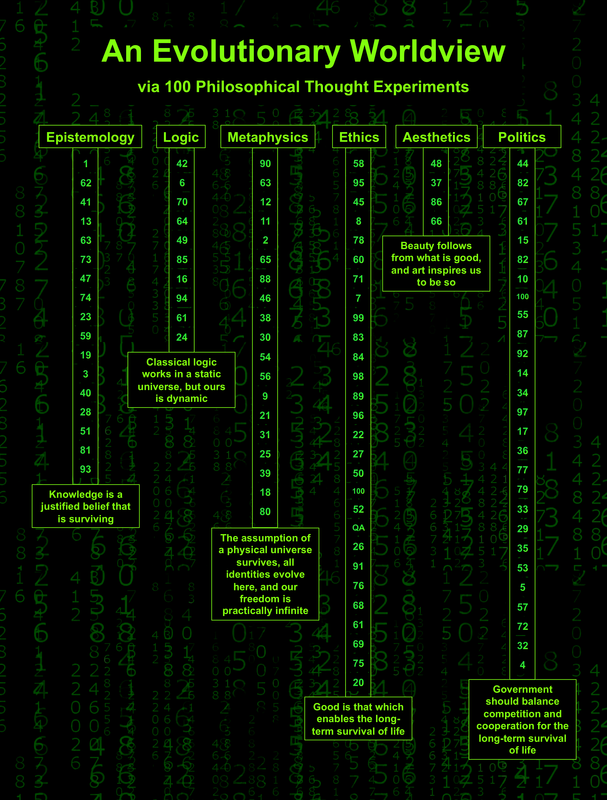 So, this picture now contains all of the major fields of biology, and therefore it can act as a guide for how to study or care about all of the life that has ever existed or ever will. And that brings me to what I think is the ultimate evolutionary consequence that we have to consider. No matter what squabbles we have, in or between any of these individual circles, the most important overriding goal that rises above everything, is that, we want all of this continue. We want the entire project of life to keep going. To fail at that goal would mean universal death. And once we agree that that consequence ought to be avoided, then these sciences can start to give us a list of what life needs in order to continue its journey. So, what are some of those needs? 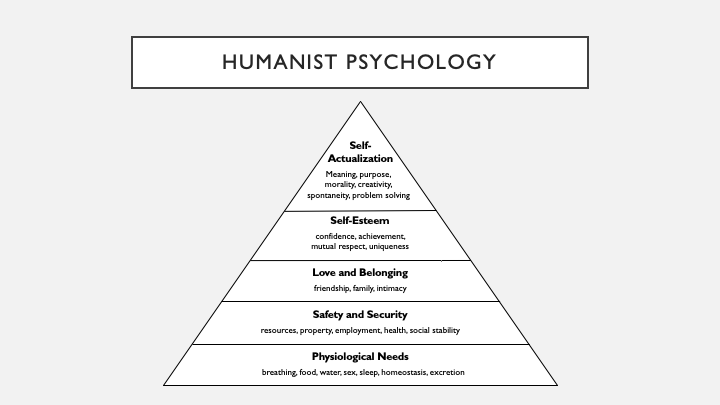 Many of you will have heard of the humanist psychologist Abraham Maslow and his hierarchy of needs. His list is often shown as a pyramid, which makes sense because life isn’t just some on / off switch. Over time, we humans have evolved to have a whole growing list of needs that makes our lives better and better and more and more secure. But Maslow—like all psychologists (and most philosophers too)—was only looking at one small slice of the entire picture of life. He was focused on the needs of one individual species. But what if he had looked at everything? What if he had looked for a list of needs for all seven spheres of biology? I won’t go into all of the details here, but this is what I’ve done in this picture as part of a paper I wrote with the help of some evolutionary psychology professors. I changed the pyramids into trees for each sphere, since they provide a better metaphor for the depiction of base needs funneling resources up into higher branches that grow towards a purpose in life. The biggest takeaway I found from this whole exercise was just how interdependent all of these spheres are. 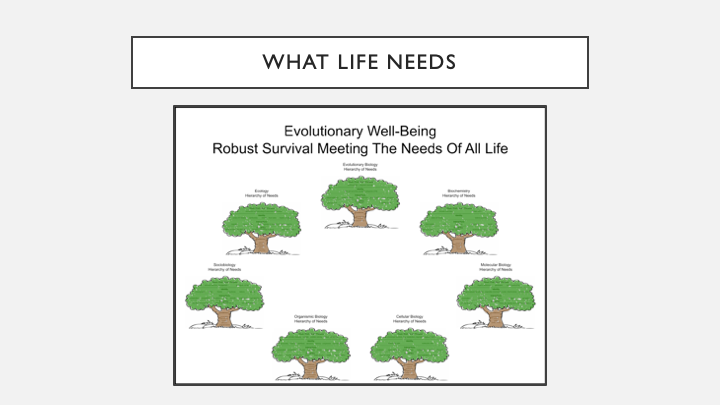 Our own Maslow needs, for example, can never be met if we don’t have good societies, productive ecosystems, and enough time to adapt to any changing evolutionary conditions. And all of these are only possible if the biochemistry and other internal processes are healthy too. In fact, since life is only as strong as its weakest link, we have to look out for the health and well-being of each and every level within all seven spheres of biology. Finding the right balance here is the key to understanding what life needs in order to continue to survive. Life wants to remain an is. Therefore, life ought to act to remain alive. In other words, the ultimate good or bad consequences of our actions are literally life or death decisions. This sounds simple enough, but of course the implementation is far from easy because it requires the balancing of many, many interests as we saw above. 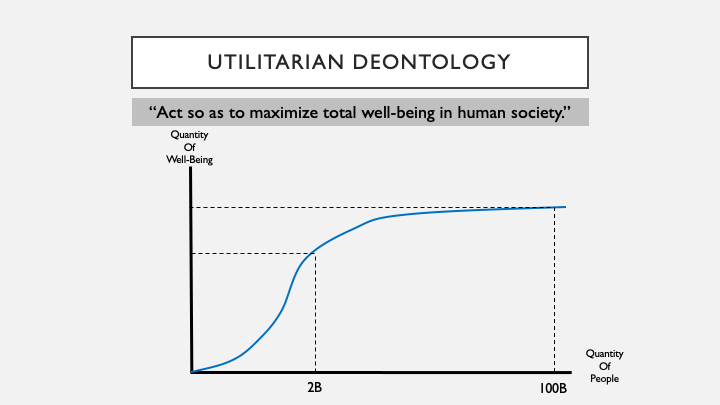 Utilitarians, on the other hand, tried to simplify their moral rule down to just one variable—act so as to maximise total well-being in human society. But if you graph the quantity of well-being against the quantity of people, you see how that oversimplification led to what the philosopher Derek Parfit called “the repugnant conclusion.” He noted that according to this utilitarian rule, a world with 100 billion people in it might be considered better than having 2 billion people, simply because the total well-being would be higher. But if you look at average happiness, it might be very high for the 2 billion people, whereas the 100 billion might all be barely above suicidal misery. And the Utilitarian rule doesn’t provide any guidance on how to avoid this. Going back to an evolutionary view of life, however, we see that quality of life is dependent on the percentage of resources used. If we could actually even get that far, 100 billion people would surely be over here on the far-right-end of the graph, consuming nearly 100% of Earth’s resources and risking slipping into universal death. They would be acting the way that Aldo Leopold described the potato bugs—as eating all of the potatoes into extinction and thus extinguishing themselves. Scarily, this isn’t far off from what we are already hearing in the news on a daily basis. 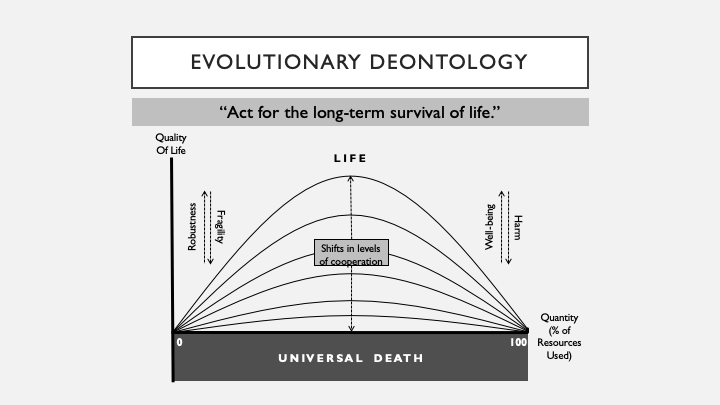 But this evolutionary view of life, however, shows that we could find a sweet spot where the survival of life can grow more and more robust and less and less fragile, and thus able to continue to try to meet the moral rule shown above. One of the ways we can do this is by creating new curves on this chart, which I say comes from shifts in levels of cooperation. Those shifts are a reflection of the work done by the evolutionary biologists John Maynard Smith and Eros Szathmary. 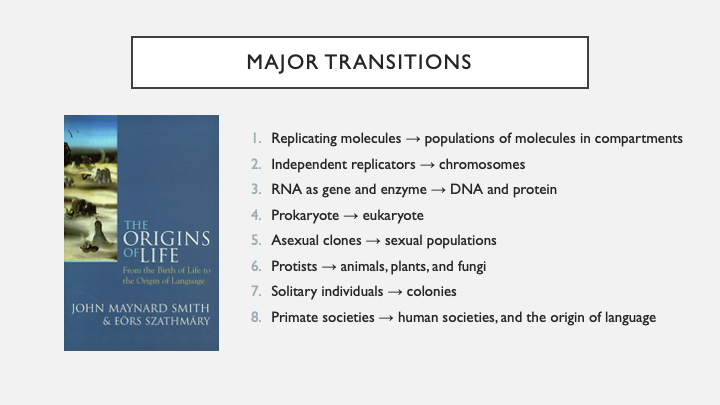 In their important book The Origins of Life, they described eight major transitions that took life from its simplest origins of replicating molecules to its most advanced form of adaptability, which are human societies built with our complex and durable language. It’s too much to go through the details of the biology in these transitions, but the big takeaway from this book is that each transition occurred when formerly separate and competitive biological elements figured out new ways to join up and cooperate with one another, and begin to evolve together. And that provides a vital clue to our next area. And that’s the third camp of this branch—virtue ethics. As I mentioned earlier, this came from Aristotle who tried to find character traits that were always virtuous in and of themselves, but other philosophers always found exceptions where these traits might not be virtuous. The most famous example of this is that honesty may not be virtuous if a Nazi comes to your door and asks you where you are hiding a Jewish child. Note that this is where we have learned to avoid the problems of past attempts at evolutionary ethics—from things such as eugenics and Social Darwinism. Proponents of those ideas may have grasped the consequences and some of the rules of evolution, but not the virtues that actually succeed. It turns out that nature isn’t always “red in tooth and claw.” And the survival of the fittest, is actually the survival of the most adaptive and cooperative. So, putting all three camps together, we now get to the full position on this third branch of our framework. And that advises us to avoid extinction and maximize survival. And in order to act for the long-term survival of life, we need to study what works, and strive to balance the needs of all of life. Hopefully, that’s a position that avoids the problems from previous attempts at evolutionary ethics, and it manages to address the difficulties that the current camps are facing too. Okay, so our next branch is politics. There are three branches left now, but I promise that these will go quickly. This might sound like a strong statement for liberal freedom, but right off the bat, critics of Mill noted that pretty much all of our conduct affects others in society. No man is an island, as the saying goes. 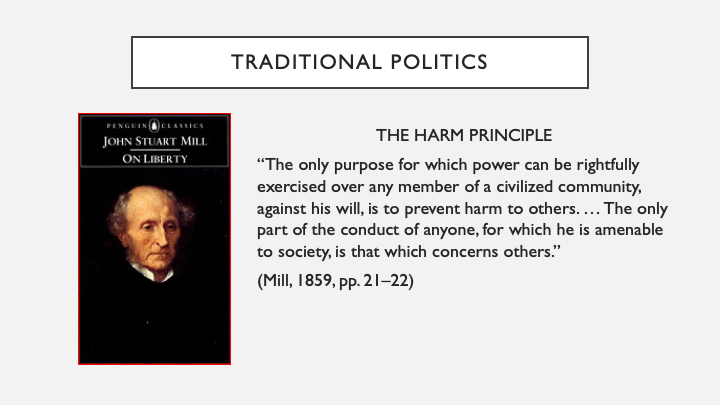 In fact, even Mill used this principle to argue that all sorts of so called “immoral behaviours” should be banned because he said they harmed Victorian society. Ever since then, battles have raged back and forth between arguments for individual freedom on one hand, or social harm on the other. Finally, in 1999, a seminal paper was published called “The Collapse of the Harm Principle” written by Bernard Harcourt. As one example of this collapse, religious conservatives in the US have recently used the harm principle to successfully defend their discrimination against homosexuals because they claimed their religious beliefs were being harmed. Just like Peter Singer left us squabbling between equal circles of moral concern, the harm principle leaves us in the same predicament because it doesn’t say anything about how to judge between competing claims of harm. In other words, what we’re saying here is that we can no longer use “freedom from harm” as the organizing principle of government. Instead, our politics should reflect evolutionary realities, and perhaps try to pursue the ethical goals that I laid out earlier. For many more details on this, you can actually read my first novel, Draining the Swamp, which is about a young idealist who goes to Washington DC and tries to improve government. 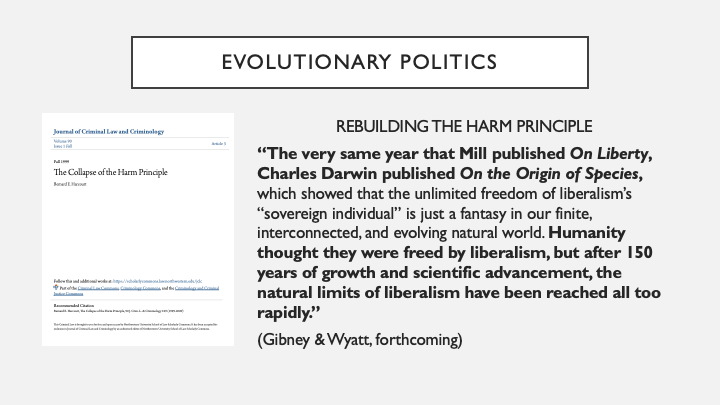 But for the purposes of this talk, I just want emphasize the point that the harm principle needs to be rebuilt in order for our politics to work properly. Next up, we have the branch of logic. This can get very technical if you want to get into the philosophical issues at play here. Essentially, though, the problem is that classical logic has always dealt with trying to prove whether things are either true or false, but as we saw earlier in epistemology, it seems like we cannot know the truth. So how do we reconcile these things? In short, the way that I deal with this is to note that if a situation is accepted as static and perfectly understood, then yes, something can be considered true or false within that situation. But as soon as things start to move and change and evolve, then all bets are off about any truth declarations. ​If anyone really wants to discuss this further, we can happily go off and get way down in the weeds on it. As long as the rest of us just agree to use reason and be rational with our logical arguments though, then I think that’s enough for us to be able to move on. A lot more could be said about this quote, but I just want to make one point about it. 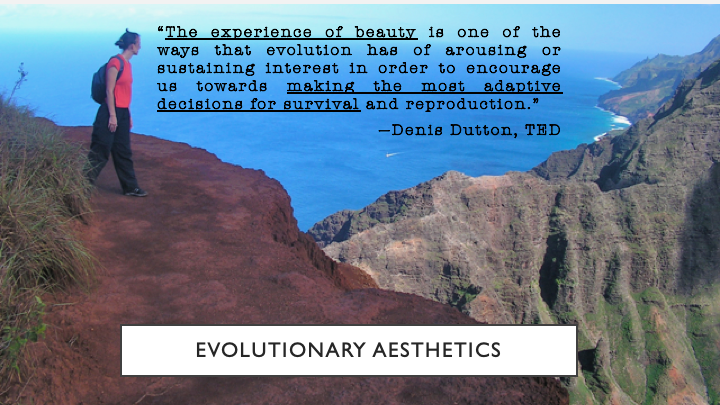 And that is that, although “the experience of beauty” may indeed be subjective and in the eye of the beholder, we now all know a lot more about “making the most adaptive decisions for survival.” And so, I think our understanding of what is beautiful ought to change accordingly. 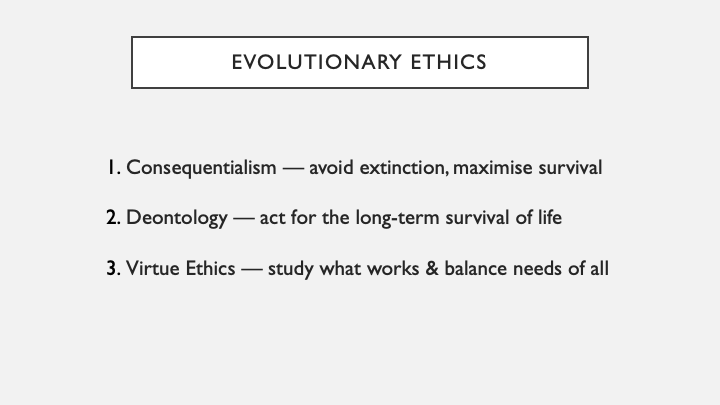 So, putting this all together, we now have a framework that captures all six elements of my evolutionary philosophy. I’m not going to go through any of this since we just went over it all, but now we have something that we can directly compare with the humanist worldview that I laid out earlier. I now know not to use the word Truth in any rigorous discussions. And I think we ought to have even more humility about what we think we know. I agree that this physical universe is all we’ve detected, and so we ought to live this one life as well as possible. I would advocate for the widest possible circle of moral concern, as that gives us an objective definition of good, which can help guide us through our moral dilemmas. When logically examining an issue, I try to understand if it is static or dynamic. And in the long run, it’s always dynamic. And finally, I too think that we humanists can experience beauty, awe, and purpose, but by focusing on the flourishing of all of life. We may only be one small part of that grand circle, but for now we seem to be privileged to be the only part that understands all of this. And at the risk of getting emotional and squishy about this, I think that’s a beautiful position to be in. And on that note, I’ll stop and say thank you for [reading], and I look forward to your questions [in the comment section below). Thank you. Hello! I was asked to speak at an event at the end of September to give my thoughts on a book called Doing Philosophy, which was written by Timothy Williamson who is the Wykeham Professor of Logic at the University of Oxford. I was one of four such speakers at the event, where Professor Williamson gave opening remarks, and rebuttals to us as well. This was all set up to be featured in the latest edition of The Philosopher (the official journal of the Philosophical Society of England, and the UK's longest-running public philosophy journal, having started in 1923) and it has now finally been published. Due to changes in the time (and space) constraints at the event (and in the journal), my full original 10-minute talk wasn't able to be given (or published), but I can happily share the complete text here. I hope you enjoy it! Timothy Williamson’s book Doing Philosophy, is being reviewed as part of an event called “The Art of Reason.” This is a catchy phrase, written as if it were a single idea, but usually art and reason are two subjects that are viewed quite separately. C.P. Snow famously put them into two distinct cultures that cannot even talk to one another. Williamson, however, makes a strong case in his book that these two cultures can be reconciled, and that philosophical thought experiments provide an excellent example of how to do so. Williamson is right. Over thousands of years, some of the best thinkers in history have churned out mountains of these trials and errors of the imagination, and they have the power to fundamentally change the way we navigate the world. They’ve certainly changed the way I do. You see, I’m a writer, and I try to write fiction and philosophy. Like all writers, though, I’ve heard the advice that you have to “write what you know.” But Socrates said, “The only thing I know is that I know nothing.” And then there was Ernest Hemingway, who once described his own process by saying, “All you have to do is write one true sentence.” But it has become common now to hear that we live in a “post-truth” world. So how do we reconcile these bits of philosophy with the conventional advice to a writer? The answer I found came from philosophical thought experiments, which shows just how powerful and useful they can be. A few years ago, I came across Julian Baggini’s book The Pig That Wants to Be Eaten and 99 other Thought Experiments. Since I’m always looking to test out my ideas, I decided to go through them all, one-by-one, for the next two years or so on my website. Many of the thought experiments taught me many different and valuable lessons, but there were three in particular that helped me arrive at an answer to the simple question of how to write “true” sentences. First, there’s Zeno’s paradox. In the version of this that I like, a race is set up between Achilles and a tortoise. The tortoise is given a generous head start, but since Achilles is much faster, he should have plenty of time to catch him. The problem, however, is that Zeno says there is no way he can ever catch the tortoise. At least not according to logic. Zeno explains this by showing how Achilles will first have to run to the place that the tortoise started from. But by that time, the tortoise will have moved further down the track. So now, Achilles will have to run to that spot. But once again, the tortoise will have moved on. And since this will happen over, and over, and over, there’s just no way that Achilles can ever catch the tortoise. Of course, in real life, we know that faster runners overtake slower ones all the time. So how do we solve this paradox? The short answer to me is that as Achilles approaches the tortoise, Zeno is asking us to divide time into smaller and smaller increments, slowing time down, until we basically have to stop, and wait, while the philosopher continues to calculate smaller and smaller distances, possibly even beyond the smallest increments in the fabric of space-time. But of course, that’s impossible. As the saying goes, time waits for no man. The universe always keeps moving. And so, Achilles can, and does, pass his tortoise. The second memorable thought experiment for this topic of truth is the one about Descartes’ evil demon. This isn’t so much a story, as it is just the creation of a really gripping character. You see, Descartes, like a lot of philosophers, really wanted to be right. He desperately wanted to prove that there was some foundation upon which all knowledge could be built. But in order to do that, he knew that he had to defeat the most powerful and pesky demon imaginable, one that just might be out there waiting to trick us and our senses. But that brings us to the third thought experiment, the Gettier problem, which I think helps us see how we can talk to these sceptics, and deal with them just fine. The Gettier problem looks at the concept of knowledge, which, ever since Plato, has been defined in the West as justified, true, belief. But Edmund Gettier managed to overturn that dominant definition with just a short two-page paper published in 1963. Honestly, Gettier’s examples are really boring — they aren’t good art — which is possibly why this hasn’t reached a wider audience. But the version that Baggini used to illustrate it is much better, so I’ll use that one to introduce it. Baggini tells us about a woman called Naomi who was at a coffee shop when she noticed a really unusual man behind her drop a really unusual keychain. She didn’t talk to him, but he was just one of those people that makes a deep impression. The very next day, Naomi was walking down the street when she witnessed a tragic accident — a car killed a pedestrian, and it turned out to be the very same man! The police interviewed Naomi to get some help identifying the body, and she told them about the coffee shop and the odd keychain, both of which turned out to be true. A week later, however, Naomi was back in the coffee shop again when she turned around and screamed. She saw the very same man fumbling with the very same keychain. He quickly calmed her down though and said that this had been happening a lot lately, ever since his twin brother had been killed last week. This might sound like a really scary admission. But all good scientists demonstrate this when they tell us that their discoveries are only ever provisional, that they could be overturned with any new observations. These scientists are using an evolutionary epistemology. To them, knowledge can only ever be justified, beliefs, that are currently surviving our best tests. This is what I call my JBS Theory of Knowledge. No number of scientific observations will prove that theory, but with the help of a few carefully constructed and creatively designed thought experiments, I think we can confidently arrive at its conclusion. So, there may not be “truth,” and as an author I may not be able to write “true sentences.” But we can all tinker around and experiment with trial and error to try to think and write things that survive. And sometimes they will. Possibly even for a long time. That’s the best we can do with all of our thought experiments — the artistic ones, and the ones of reason. I think this is great news because it means authors and philosophers will never run out of work. This is also why Williamson’s book isn’t called How Philosophy is Done. Philosophy is not, and seemingly never could be, a finished product — it’s an ongoing verb. And that’s why I highly recommend picking up one of the many collections of thought experiments that are out there. They’re a great way to sit back and enjoy a bit of fiction, and as Williamson advocates, an even better way to keep doing philosophy. ​Please visit my shop if you'd like to buy this or any of my other works..
Let the blogging of fiction begin! I've been talking for a few posts now about wrapping up my essays on philosophy and using this space to share fiction that discusses and displays the ideas I care about. Well, here goes. Way back in June 2016, the American Philosophical Association posted an advertisement for a short story competition. Entries were due February 2017, and winners were announced at the end of April. I did not win, but the first place and second place entries were published in June on the Sci Phi Journal's website. The people running the contest initially said they were going to put together an edited volume of selected stories from a few of the 704 entries they received, but since I haven't heard anything about that yet, I'm going to assume it's safe to finally share my entry here. As noted in the competition rules, entries had to be "at least 1,000 words and no longer than 7,500 words. The submission should also be accompanied by a brief "Food for Thought" section (maximum word count: 500, not part of the overall word count), where the author explains the philosophical ideas behind the piece." So, without further ado, here is my entry (2538 words) and its accompanying food for thought (another 479 words). Your reactions and critiques will be most welcome! Better think twice about that decision! Subject two; experiment one. Programmed minimum temperature is 68 degrees Fahrenheit. Actual room temperature will be maintained at 75 degrees Fahrenheit. The doctor flicked off the switch to Sergei’s microphone, but made a statement aloud for the room’s monitors. The doctor turned Sergei’s microphone back on, but left the room to go out for a lunch break. Subject two; experiment two. Programmed minimum temperature is 68 degrees Fahrenheit. Actual room temperature will fall slowly from 70 degrees to 67 degrees, before returning back to 70 degrees. Subject two; experiment three. Programmed minimum temperature is 68 degrees Fahrenheit. Actual room temperature has dropped suddenly to 65 degrees and will remain there for one hour. Subject two; experiment four. Conditions will be returned to those of experiment one. Programmed minimum temperature is 68 degrees Fahrenheit. Actual room temperature will be maintained at 75 degrees Fahrenheit. Again there was a long pause from Sergei before the words began to flow across the screen, hesitantly. Subject two; experiment five. Conditions will remain stable. Programmed minimum temperature is 68 degrees Fahrenheit. Actual room temperature will be maintained at 75 degrees Fahrenheit. Batteries are almost empty now. Thomas Nagel’s famous paper—“What is it like to be a bat?”—explored theories of consciousness and the mind-body problem by asking us to consider the subjective experience of a fellow animal that possesses more senses than we humans do. “Thermostat 2Ba” explores similar terrain, but by going in the other direction. By depicting the birth-to-death life cycle of a human consciousness that has been confined to just two basic sensations (three if you count the battery drain), this story sharpens the focus on the role that senses play in our inner lives. Empiricists argue that knowledge can only come after sense perception, so there are real epistemological barriers that would stop someone in Sergei’s position from being “fully human.” For similar reasons, we may not be able to ever truly “know” what it is like to be a bat, or to be a thermostat, but what does your imagination lead you to believe about the desirability of such an existence? Did you get sad when Sergei ran out of power? Why? Or why not? Since the number of Sergei’s biological senses has been reduced, “Thermostat 2Ba” also raises questions about David Hume’s bundle theory. According to Hume, objects are only a collection of their properties. Nothing more. As most of Sergei’s human properties have been stripped away—his body, his biochemistry, his hierarchy of needs, his senses of touch, taste, smell, and sight—how human does Sergei actually remain? Over the course of the story, Sergei’s moods are driven by the temperature in the room. He is calm when the room is safely comfortable; he is edgy and slightly paranoid when the temperature is close to triggering his response; and he is full of rage and anger when the room is too cold. In a much more complex manner, our own moods are usually driven by environmental factors. What might this mean for “uploaded” consciousnesses? Would personalities without mood swings be human personalities? When Sergei’s microphone is turned off and the warmth in the room is kept above his temperature requirements, what is there for Sergei to do? Or be? Finally, in addition to the questions raised about the spatial-temporal experience of biological animals, “Thermostat 2Ba” asks us to reconsider the goals and endpoints of Transhumanism and Artificial Intelligence. If a consciousness is to be “uploaded” or created from scratch, what requirements might there be for interaction with the world in order for this consciousness to be genuine and rich? John Searle’s “Chinese Room” thought experiment asked whether syntactic rules of computation could ever be enough to generate semantic meaning. 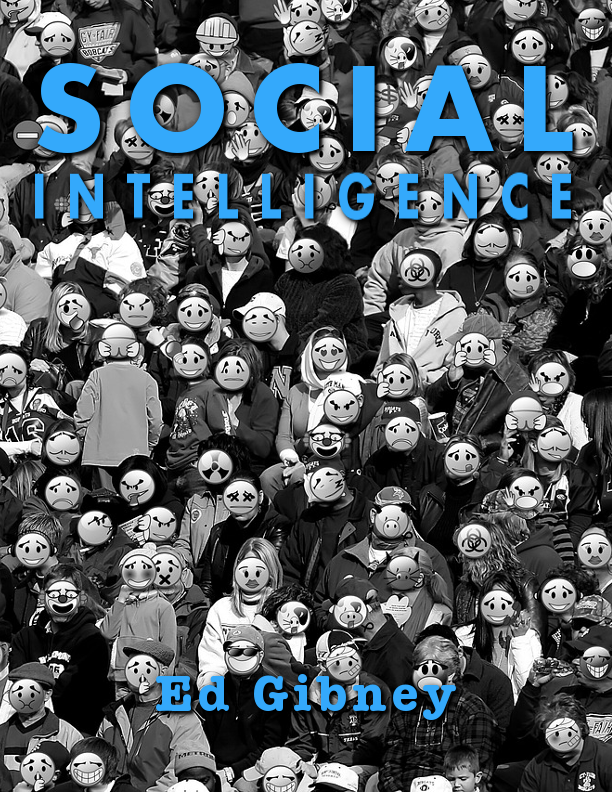 Giulio Tononi’s “Integrated Information Theory” posits that the more information about the world that one can gather and manipulate, the greater level of consciousness one also attains. In light of this, would Sergei’s situation be a virtuous goal to achieve? If not, what would make his situation acceptable?